Some horse breeds were developed specifically to be driving horses. Light horses and light draft types are suited to pulling the lighter vehicles often used for pleasure and competition driving. These aren’t the heavy draft types we see pulling hay rides, horse pulls and at plowing matches, but horses that are smaller, lighter, faster and more agile than their heavy horse relatives. 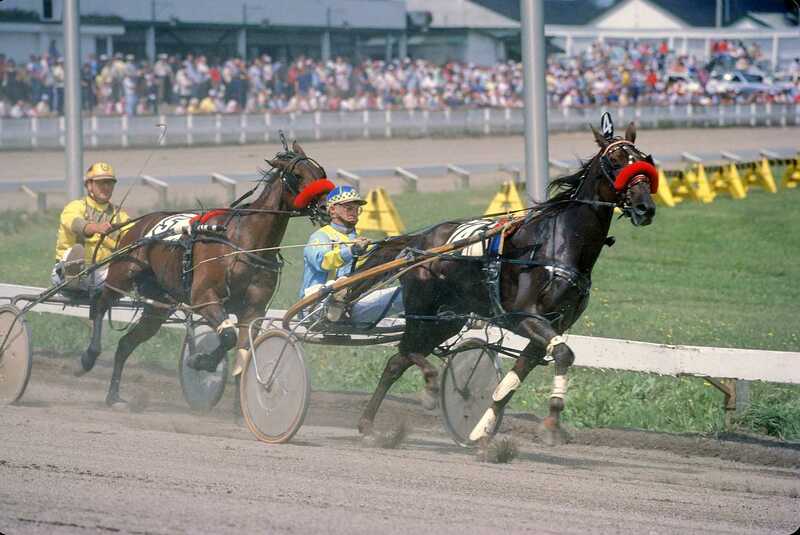 The American Standardbred is a very popular driving breed for both racing and pleasure driving. A former racing Standardbred can be retrained for pleasure driving. It’s important to remember that the what is desirable in a racehorse may not be desirable in a pleasure horse and that you must re-teach some Standardbreds to respond correctly to rein aids. The benefit of re-training an off-the-track Standardbred to be a pleasure driving horse is that they are already accustomed to harness and vehicles, farriers and veterinarians as well as crowds, motor vehicles and the other exciting things that make up the life of a racehorse. Many former racehorses are available for adoption, so this can be an economical choice if you’re willing to put the time into re-training. Standardbreds can also make good riding horses and there’s no reason why this breed or any other can’t do both. Whether it’s a section “A” pulling a tiny dog cart or Cob pulling a two-seater buggy, Welsh Ponies and Cobs are wonderful in harness. Cobs are the horse-sized members of this family. Not only are they beautiful, but they are also hardy and easy keepers. They are equally at home under saddle and if you’re interested in competition under saddle and in harness, there are many shows dedicated to the breeds with classes that showcase their talents. With its high-stepping action and elegant head carriage, it’s hard to believe the Hackney Horse is on the endangered breeds list in some countries. This breed was initially bred for riding, but it was crossed with driving horse breeds and eventually thoroughbreds were introduced to produce a horse that was fast and elegant, like a sports car of today. The Hackney Horse is still an eye-catching sight, with its snappy knee action and brisk gaits. The Cleveland Bay is as its name suggests, a bay horse used for both driving and riding. They stand about 16hh. Queen Elizabeth II breeds Cleveland Bays and members of the royal family use this breed for competition driving. 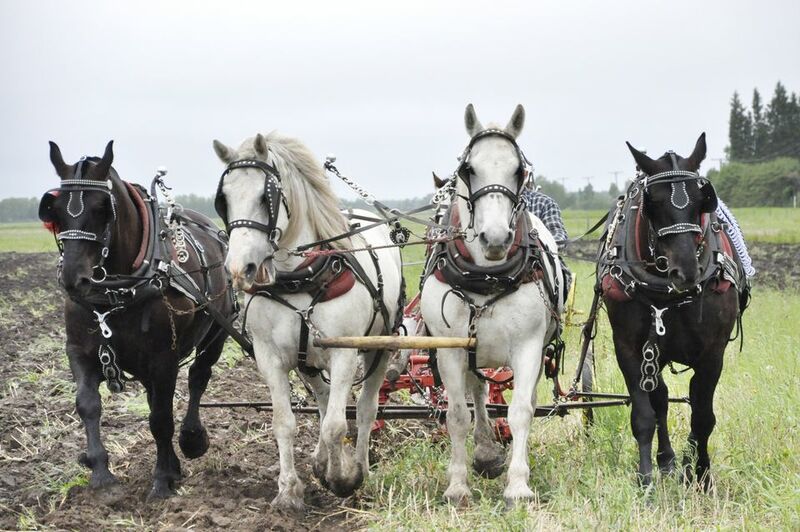 It is regarded as a light draft horse and was used for farm work and in teams to pull larger carriages. This breed, too, may be endangered in some places. This is a common problem for driving breeds since motor vehicles and farm equipment took their jobs. Better known for their speed and talents under saddle, thoroughbreds are also used in driving, especially events that require speed like combined driving, chuck wagon and chariot races. Thoroughbreds are also used for pleasure driving. Like retraining a OTTB for riding, retraining one for driving takes skill and an understanding of the temperament of the horse. Another breed sometimes regarded as a light draft type, often seen in harness, is the Friesian. This breed originates from Holland and was used to carry knights into battle. The breed has seen near extinction, but in recent years has become more popular. They are very eye-catching with high-stepping gaits, and powerful and elegant self-carriage. You might remember seeing a distinctive Friesian horse in the movie series "The Lord of the Rings" and several in the series "Game of Thrones." Vermont state’s official horse, the Morgan, is a light warm-blood that is often used for pleasure driving and competition. Bred as an all-purpose horse, the Morgan could plow the fields during the weekday, go out hunting on Saturday and pull the family buggy to church on Sunday. They are a good beginner horse and even today, they are a great family horse under saddle and in harness. Any horse can be a driving horse. These are just a few that have been bred specifically for the job. Do You Like One of the Most Popular Horse Breeds?